Draglines don’t last forever; it just seems that way. Mining-class machines with booms that reach hundreds of feet into the sky, cost $100 million and up, and in some extraordinary cases weigh as much as 28 million lb are built to last—and to perform, with the larger models swinging empty buckets heavier than a Cat D11 dozer, completing a digging cycle every minute or so and moving upward of 25,000 yd3 of material per shift. Even though draglines are as close to permanent fixtures as any mobile machine could be in mining, change always comes—parts break, systems wear out or become obsolete and inefficient, or the area being mined simply becomes depleted and the machine is needed elsewhere. Repairs, upgrades, overhauls and relocations are common but almost never routine, with machine age, size, upkeep, location, site characteristics and production demands combining to generate unique challenges that require innovative solutions. And while draglines keep on digging, decade after decade, the industry around them has changed. The number of dragline manufacturers has dwindled from the half-dozen that were active until the mid-80s down to just two in the Western world—Caterpillar and Joy Global. Sweeping changes in ownership, employment and mining-industry structure in general have depleted the ranks of old-timers with deep experience in dragline operations and repairs, while the prospect of working on some of the world’s largest mobile equipment holds less interest now for young people entering the workforce and who are more familiar with Big Data than Big Iron. The situation isn’t actually as bleak as it sounds. Dragline owners still can get their machines fixed, upgraded and moved, and probably more efficiently than ever before. Innovative solutions to typical dragline problems involving booms, motors and gears continue to be developed, and this article will take a look at some of them. The relatively small number of draglines in any particular region of the globe makes it difficult, both financially and logistically, for OEMs to justify the expense of a dedicated dragline service team. This has opened avenues of opportunity for third-party erector, rigging and repair organizations to establish a larger footprint in the dragline service sector. Meanwhile, advances in machine and software technology offer the prospect of smoother, less stressful digging, leading to longer machine life. Researchers in Australia, for example, are pursuing development of a system to provide semiautomated dig-sequencing assistance to operators for increased machine efficiency (see sidebar). However, certain principles haven’t changed when it comes to keeping these machines healthy, productive and available where needed. One of these enduring constants is the overriding need for good planning in any major dragline maintenance or relocation project. Clayton Huebner, manager of the mining division of industrial-construction specialist CCC Group, told E&MJ that the most successful dragline projects generally are those in which the owner “teams up” with the contractor and engineering firm, becoming a crucial link in the project chain, and in the process possibly becoming aware of—and subsequently avoiding—pitfalls that a less-involved owner might encounter. Having completed 70-plus dragline projects at more than 50 mines worldwide, the San Antonio, Texas-based company has a good grasp on what’s needed to accomplish complex dragline jobs. Another important aspect is project safety. Worker health and safety is perennially a top concern for mine management, but that concern is shared by industrial contractors, said Huebner. “We understand the tremendous pressure to get a machine back up and running, but allowing enough time to do the job safely is very important,” he added. Huebner also called attention to schedule problems arising from “owner-supplied components”—long-lead parts and materials needed to carry out the work. “When it comes to dragline-sized gears, forgings and cast parts, you’re often looking at plus-52-weeks lead time. If they don’t show up at the site on time, you’re definitely looking at a possible schedule impact. “An owner’s procurement personnel, particularly if they’re somewhat new to the industry, may not be aware of these lead time requirements, which is why I can’t stress strongly enough having the machine owner deeply involved in the project planning from the start,” he explained. As an example of an appropriate time frame on a large dragline project, Huebner said early discussions with the owner on a recently completed boom-replacement job for a large dragline in the midwestern U.S. began three years ago, and meetings with the project contractor and engineering firms began two years before project kickoff. About a year and half out from project startup, all parties began meeting on a monthly basis to iron out details. On the other side of the coin, project owners now typically depend more on outside engineers and contractors for services that once were often done in-house. That’s one of the reasons that CCC Corp. has had a long-term strategic alliance with Joy Global. “With this alliance, a project owner gets the benefit of having Joy Global—which has its own dragline service division—handling parts sourcing, upgrades, engineering and other OEM-related services, along with CCC Group., which can provide logistics, labor and expertise for the field-based industrial construction, rigging, heavy welding and similar aspects of dragline erection, restoration or repair,” Huebner said. In the past few years, CCC Group has renovated a Marion 7820 dragline for phosphate producer Industries Chimiques du Senegal on-site in Africa; disassembled/transported/reassembled and upgraded a Page 757 dragline as part of a machine relocation from a Wyoming site to a Texas mine; and similarly disassembled a Bucyrus 2570W dragline in Alabama for subsequent relocation and commissioning in Colombia. The Page 757 project was detailed in E&MJ’s sister magazine, Coal Age, in March 2015. Moving one dragline any significant distance is generally a daunting undertaking. But for one company to move four of these machines a total of 30 miles within a period of less than five months is unusual. 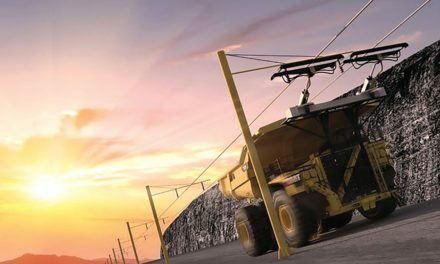 Luminant Mining, a subsidiary of Energy Future Holdings Corp., simplified the process by using an innovative approach for transporting—not walking—four draglines of three different sizes to new work sites up to 15 miles away at its operations in Texas. “It usually takes several years to disassemble and rebuild a single dragline, or months of planning and preparation to ‘walk’ them to new mining sites. With our longest move spanning 15 miles, we needed to find a way to safely, efficiently and cost-effectively transport the draglines,” said Steve Kopenitz, Luminant’s senior vice president–mining. Brad Gadt, heavy equipment outage and relocations manager at Luminant Mining, explained at Mining Media’s Haulage & Loading 2015 conference how the multi-dragline move grew from two machines to four. Initially, plans were to move two Caterpillar 8750 draglines from one site to another—one by walking it, the other by some means of transport. “We didn’t want to tear them down” for the move, Gadt noted. After considering available options, the company decided to use the services of Mammoet, the global heavy-lift and transport specialist headquartered in The Netherlands. 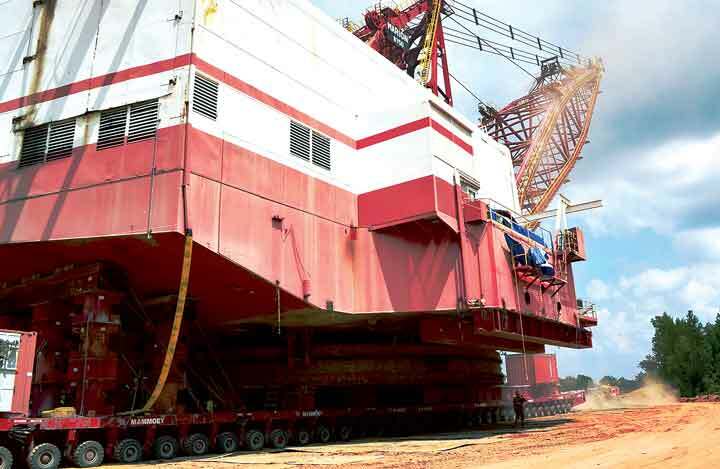 Working with Mammoet USA South, Luminant arranged to employ Mammoet’s self-propelled modular transporters (SPMTs)—platform vehicles with modules of four, five or six axle lines—to move the two big draglines. The modules can be connected to multi-wheel transporters to move loads that are too big or heavy for a truck or low-boy. The SPMT can rotate around its center to make a 360° turn and also can move sideways. Each SPMT axle can carry up to 40 metric tons (mt), including its own weight. The modules fit on a normal truck. A separate power pack drives the connected modules and supplies hydraulic pressure for the steering, driving and height adjustment of the modules. As news of the impending moves spread throughout the company, other Luminant mines became interested, and the two 8750s were joined by a Cat (Bucyrus-Erie) 1350 and a Cat (B-E) 1570 that also were in line for relocation. “We kept Mammoet’s equipment busy from April 2013 to August 2014,” said Gadt. Over the course of the four moves, about 60 SMPTs, powered by up to nine 600-hp diesel engines, were used to transport the draglines—the smallest (the 1350) weighing 6 million lb and the two 8750s weighing 13 million lb each. In fact, the combined weight of the two smaller draglines barely equalled the weight of one 8750, considered to be the world’s second largest dragline model in terms of bucket capacity. All of the draglines were lifted—once their shoes and any other components that might get in the way were removed—by an engineered jacking system and supported by cribbing that was sequentially removed as the SPMTs were positioned under the dragline. The 1350 was moved 3.5 miles, the 1570 traveled 6.7 miles, while one 8750 was moved 15 miles and the other 8 miles. The smaller draglines required 120 and 150 SMPT axle lines, respectively, while the 8750s required 240 lines. 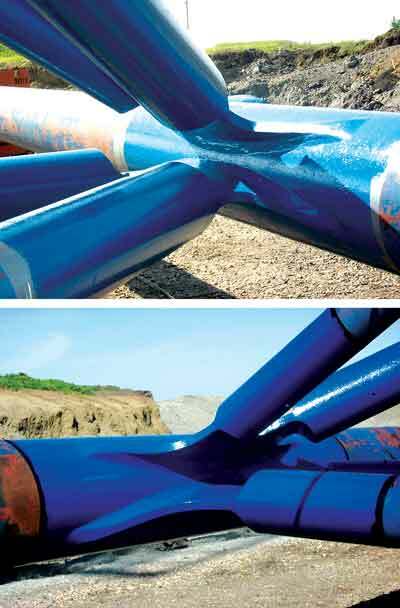 BMT WBM says its DuraCluster repair design can add years of life and productivity to fatigued dragline boom elements. The 1350 relocation project, according to Gadt, included 10 days for equipment mobilization and loading. Transporting the dragline to the new site, once loaded, took only two days and then four more days to unload and demobilize the equipment. The 15-mile relocation of one of the 8750s, as could be expected, took quite a bit longer—11 days to mobilize and load, 15 days to transport and four days to unload and demobilize—but the longer time needed for transport was actually due to inclement weather during the move. Moving the draglines by transporter was significantly cheaper than walking them or tearing them down, shipping them and reassembling them, said Gadt. A large part of the project cost was the initial mobilization of the transport equipment at the site—and once it was there, why not use it on more than one machine? There also were other advantages: “Transporting them didn’t damage our haul roads, like walking them does,” he explained. “Once a large dragline has walked on a haul road, it seems like it’s always difficult to restore the correct road profile.” The roadways needed to accommodate the SPMTs also could be narrower—and thus cheaper, with less dirt work—than a walkway, while elimination of the need for a trailing cable made the operation quicker and more efficient. The transporter approach also avoided excessive wear and tear on the machines’ propel gearing during the long moves. There were other lessons learned, as well—such as, “plan for a lot more space at the loading and unloading sites for equipment than originally estimated.” According to Gadt, the mobilization site for the 1350 dragline move alone received roughly 20 truckloads of equipment a day for three days. When major components on a dragline fail or wear out, the cost to replace them often starts in the million-dollar range and can quickly jump to double-digit numbers in the case of crucial parts such as major gears or the boom. 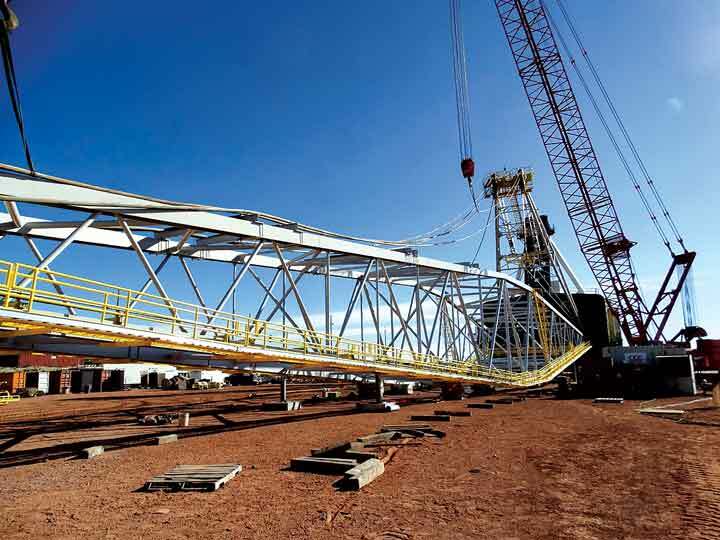 Companies such as L&H Industrial, based in Gillette, Wyoming, USA, can somewhat alleviate the economic impact from a major dragline component failure, either by providing innovative repair options or by supplying in-house engineered assemblies that surpass OEM standards and performance. L&H, for example, markets walking arm modifications for draglines that include a stronger, forged crank and can increase the walking arm lifespan up to 50%, according to the company. On the repair side, it can provide large-gear rebanding, a process that removes worn gear teeth from large gears and replaces the material with a new, high-quality rolled ring forging from which new teeth are machined, conserving the original hub and web plates. It also conducts concept-to-prototype, shop-to-field development of improved heavy-machinery assemblies as part of its Omega products line. In another example, a subsidiary of BMT Group Ltd. reported earlier this year that it had successfully applied an innovative modification and repair scheme to bolster the service life of cluster joints on an existing tubular dragline boom. 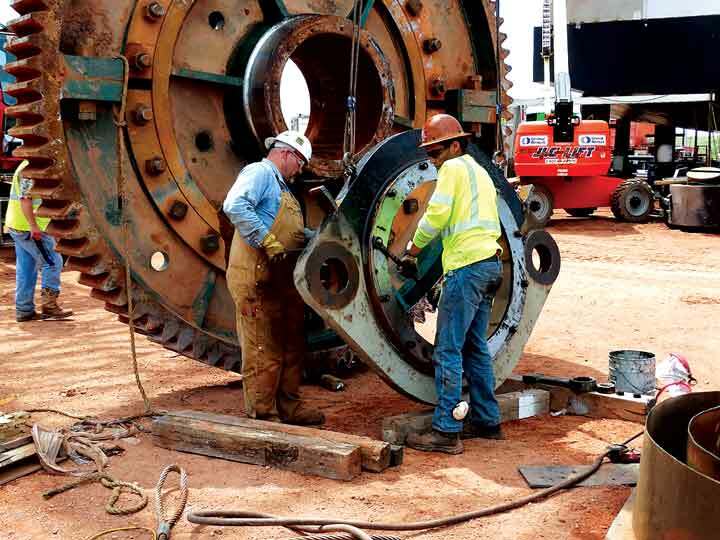 A major component of a dragline boom propel assembly—gouged from a lubrication system breakdown—was repaired on-site using an innovative metal plating procedure, saving the owner days or weeks of downtime. Dragline booms consist of tubular chords with interconnecting lacings welded to the chords at cluster joints. Stresses are concentrated at the cluster joint weldments and over time, fatigue cracking occurs. Working with a major coal producer, British Columbia-based BMT WBM replaced a number of fatigued boom clusters with its own DuraCluster design, employing an approach that eliminates the need to cut and replace windows in lacings by removing the problematic design detail and improving load paths. DuraCluster can also extend the fatigue life of dragline booms by reducing the stress concentrations, according to the company, adding that once implemented, this modification cuts maintenance and inspection workloads. On a recent job for Westmoreland Coal Co., BMT said it was able to offer the customer both reduced downtime and outage costs, as it completed all needed work in the allocated time frame. Once installed, DuraCluster reduced the risks to operators and maintenance teams in having to lower the boom and carry out complicated weld repairs with limited access. BMT said patent rights for the Dura-Cluster design have been granted in Australia, South Africa, India and North America, and discussions are taking place with potential clients in each of these regions. BMT is an international design, engineering and risk management consultancy, working principally in the energy and environment, marine risk and insurance, maritime transport, defense and ports and logistics sectors. Its customers are served through a network of international subsidiary companies. 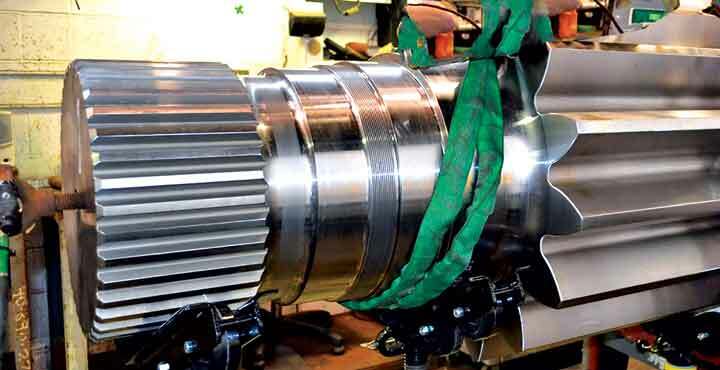 In many types of large mining equipment, pinion gears are an essential part of gear train assemblies. If not maintained regularly, lubricant for pinion gears can leak out through a bearing seal and potentially cause the bearing to seize and gall the bearing journal. Removal of the seized bearing often results in additional gouging damage to the bearing journal surface. As reported in E&MJ late last year, in a repair procedure devised by Horsburgh & Scott Co., a damaged dragline bearing component was recently repaired on-site and returned to service in a fraction of the time needed for traditional repairs. In this case, the pinion gear bearing journal in the boom drive mechanism had incurred a gouge that was 0.030 in. deep, 0.75 in. wide and 12 in. long; in addition, the journal was 0.012 in. undersize. This type of damage is usually resolved by component replacement or by repairing the damaged area. Component replacement can be costly and may take four to six weeks. Welding can weaken the strength of the substrate. Repair procedures require the part to be removed from the equipment, taken off-site for pre-processing machining to remove the defects in the journal and then post-processing machining for dimensional restoration. Horsburgh & Scott, based in Cleveland, Ohio, USA, instead used the SIFCO Process, a portable plating procedure used to selectively electroplate localized areas. With this approach, defects are typically plated on-site with one or more layers of copper, and then covered with a wear-resistant layer of nickel. In this repair, the bearing journal was first plated with copper and then masked for the defect repair. The gouge was filled with three layers of copper and hand finished in between each layer. Once the gouge was repaired, the outside diameter was plated with nickel. This, according to the company, resulted in a repair that was significantly less expensive than other alternatives requiring pre and post-process machining, and took only days instead of weeks to accomplish. 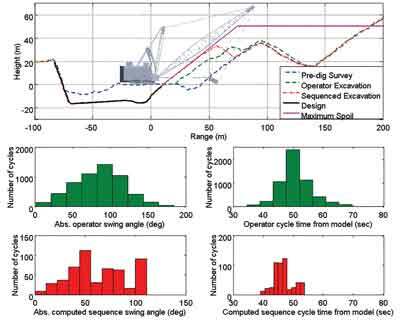 MineWare, an Australian technology company, recently completed the first stage of a project aimed at identifying the best sequence of operations and movements for a dragline to excavate in the most efficient and productive way. It is collaborating with CRCMining and the University of Queensland to develop futuristic dig sequencing technology in a project funded by an ACARP (Australian Coal Association Research Program) grant of more than $600,000. MineWare CEO and project co-leader Andrew Jessett said this stage of the project has focused on the design of the dragline excavation sequencing system, underpinned by a sophisticated algorithmic approach combining real-time DTM scanner technology, 3-D mine plan profiles and operator feedback. “Leveraging MineWare digital terrain mapping capability, the dragline excavation sequencing system will act as an onboard supervisor that can continually monitor the state of the excavation and guide operators to compute the optimal dig sequence,” he said. The prototype’s algorithmic approach effectively creates a strategy for excavating material along the strip to reduce cycle times, improve utilization of spoil and the rate of lineal advance, as well as maximize productivity. 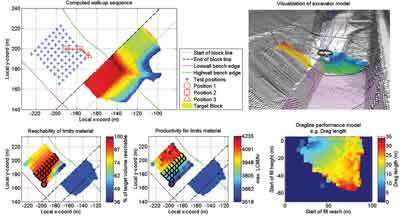 In stage two of the project, the team will trial the algorithm on a fully operational production dragline, integrated into MineWare’s Pegasys Dragline Monitoring system. Possible future goals may include development of automation technologies that build naturally off the excavation sequencing information provided by the operator assistance technology. 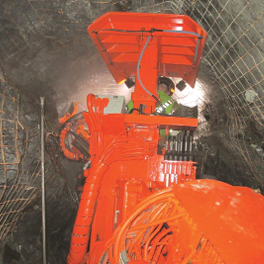 Additional benefits for mining companies include an increase in coal uncover rates; improved safety by avoiding leaving high/low walls in danger of slumping and reducing the need for surveyors in the pit; increased operational reliability and consistency, and lower duty cycling. MineWare develops advanced dragline and shovel monitoring technologies for the global surface mining industry. Brisbane, Australia-based CRCMining is engaged in research and innovation for the mining industry.